THIS POST IS IN PARTNERSHIP WITH ZOLA. THANKS FOR SUPPORTING THE BRANDS THAT SUPPORT INSPIRED BY THIS! Gone are the days of ordinary wedding stationery. Gone, we say! Save-the-dates, invitations, and signage have already started to move in the direction of non-traditional, and we are forecasting 2019 to continue to be full of new and cool wedding invitations to welcome guests to your big day. But that’s not all, in a nod to Marie Kondo, we also expect to see a return to minimalism for black tie affairs. If you are looking for one or the other, you can find both ultra creative and classic black tie stationery at Zola. Yes, Zola! Everybody’s favorite wedding registry site also offers wedding websites, guest list managers, and yes, stationery! 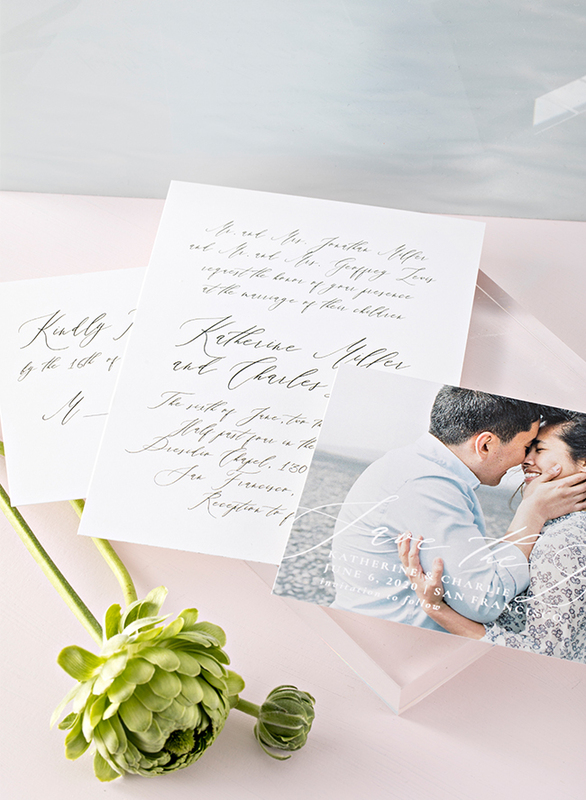 From save the dates to invites, Zola offers designs that are not only beautiful, but also match your free Zola wedding website, so you can pick a theme and stick with it! And as one of the first pieces to consider when planning a wedding, we suggest you do just that. 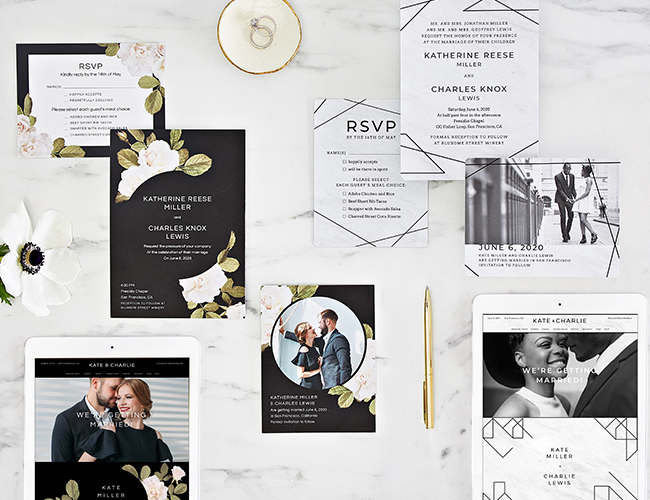 We talked to Jennifer Spector, Zola’s Director of Brand and wedding expert, about the coolest stationery trends of the year. With over 200 designs to choose from, you will be able to find just the trend you are looking for. 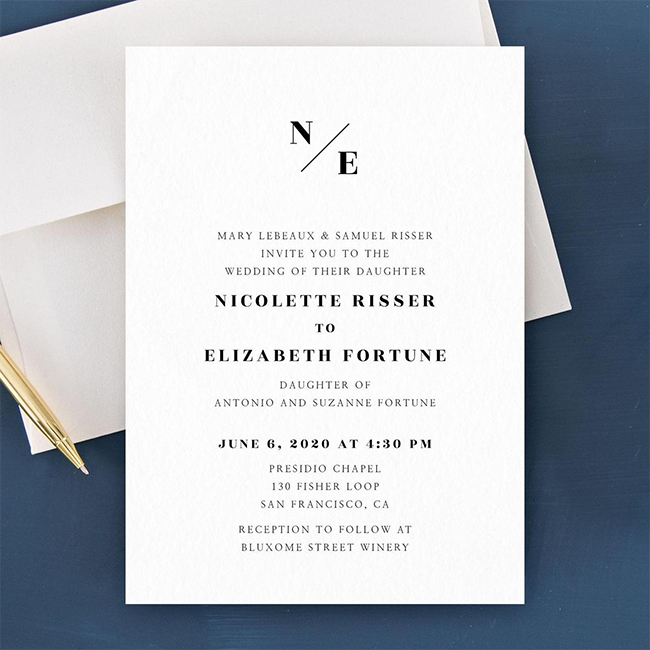 “The biggest invitation trend we’ll see this year is minimalism. 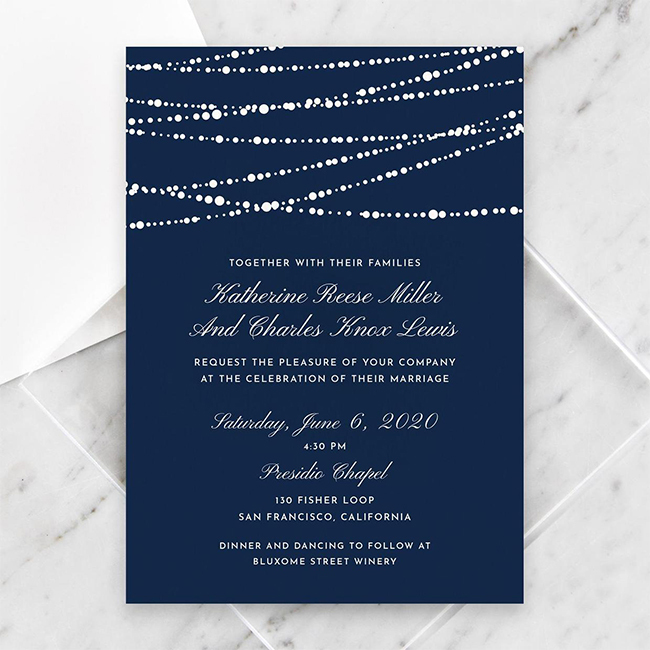 Extravagant invitations are very beautiful, but you can make a statement with a sleek and modern design,” says Jennifer. And we couldn’t agree more! How chic is this understated suite? No matter the air of casualness or formality, this style is perfect for any wedding, which is great if you haven’t decided on the tone of yours yet. “Save the dates and invitations set the tone for the big day. So for those non-minimalist couples, big bold patterns are all the rage. 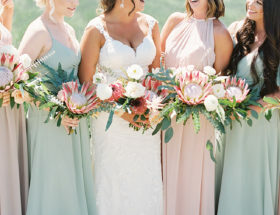 Some of our most popular designs include the Cruise, which is a huge tropical leaf pattern perfect for a tropical wedding, and the Peak, perfect for a bright poppy affair. I’m excited to see colors like red and orange making their way into the invitations landscape. Think it’s just about the invite, think again! 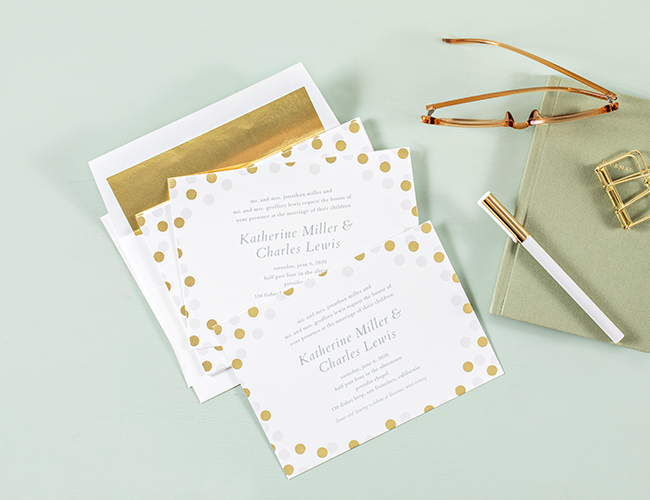 From the moment your guests open their mail, introduce them to the vibe of your wedding with envelope liners. “Envelope liners are an easy upgrade that can make your invitations feel extra special. It is an upgrade, but will have a huge impact without costing you a fortune!” says Jessica. We know when going for extra fun or extra formal invitations, things can get pricey, so we love that Zola’s stationery is also super affordable. 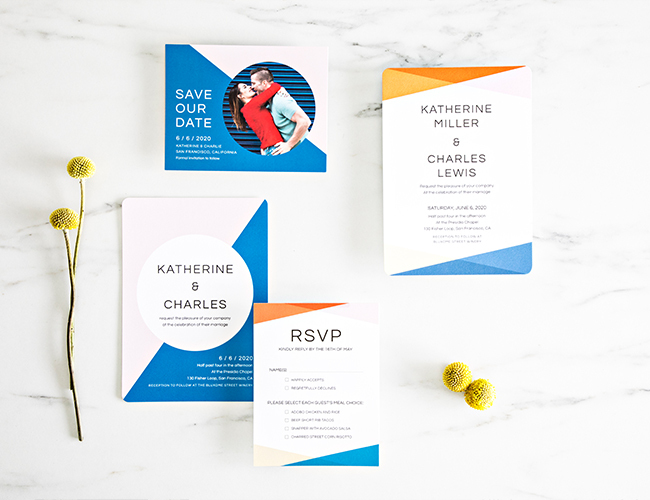 Once you have decided on the invitation trend you would like to try, be sure to carry it through the rest of your wedding stationery and your wedding website, at the very least! Wondering what comes next? 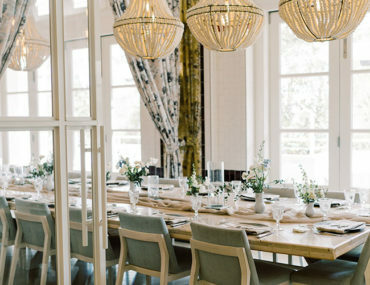 Check out these wedding planning tips for a step by step guide to planning your wedding!